The White River forks into the White Clay Creek near the small community of Oglala on the First Nations Pine Ridge Lakota Reservation in South Dakota. The original Lakota name was “Makhízita wakpá” which literally translates to “White Dirt River”. The White River is a Missouri River tributary that flows 580 miles (930 km) through Nebraska and South Dakota. The river got its name from the water’s white-gray color, which is colored by eroded sand, clay, and volcanic ash carried by the river from its source near the Badlands. Draining a basin of about 10,200 square miles (26,000 km2), about 8,500 square miles (22,000 km2) of which is in South Dakota, the stream flows through a region of sparsely populated hills, plateaus, and badlands. The river sometimes has no flow at all, due to the dry climate surrounding its badlands and prairie basin. Thunderstorms have been known to cause brief intense water flow which can cause substantial damage to livestock and humans if caught unprepared. The White River has generally good-quality water. The Pine Ridge Indian Reservation (Lakota: Wazí Aháŋhaŋ Oyáŋke), also called Pine Ridge Agency, is an Oglala Lakota Native American reservation located in the U.S. state of South Dakota. Originally included within the territory of the Great Sioux Reservation, Pine Ridge was established in 1889 in the southwest corner of South Dakota on the Nebraska border. Today it consists of 3,468.85 sq mi (8,984.306 km2) of land area and is the eighth-largest reservation in the United States, larger than Delaware and Rhode Island combined. 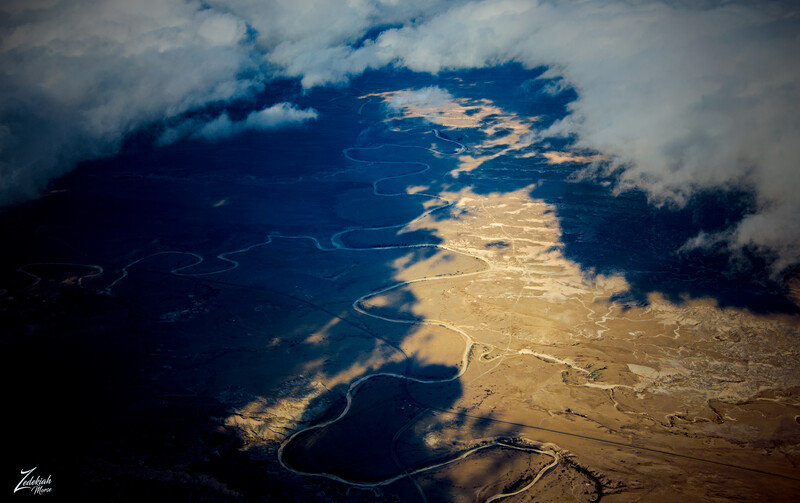 I lensed this interesting image while flying and scouting around the Black Hills and Badlands wilderness.